What the hell is a RECURSIVE query and a common table expression (CTE) and why should I care? CTE just specifies a way of defining a commonly used table expression (sort of like a view, but can also be used within a view (at least in SQL Server), we admittedly haven't experimented with 8.4 yet). A recursive CTE is a CTE that uses itself to define itself. There are two main reasons why people use CTEs (or rather why we use them). Simplify repetitively used select statements but that are not used outside of a specific body of work. True you could often break these out as SQL functions, but clutters the space if not used anywhere else and violates our general rule of thumb of keep code closest in contextual space to where it is most used so its purpose is obvious and it can be more easily extricated when it becomes obsolete. Create recursive queries - such as those defining tree structures. Again in many cases you can perform these tricks in current PostgreSQL versions already using recursive stored functions. Some good examples on how this would work in 8.4 can be lifted off the recent hackers thread on WITH RECURSIVE. Well PostgreSQL 8.4 won't have complete support of Windowing Functions, but it looks like it will be on par or slightly better than what is available in SQL Server 2005, but not quite as good as Oracle and DB2. So to summarize from discussions read. http://umitanuki.net/pgsql/wfv04/design.html and also the hackers Windowing thread http://archives.postgresql.org/pgsql-hackers/2008-09/msg00001.php. For those running RedHat EL, Fedora or CentOS and too lazy to compile yourself, check out Devrim's 8.4 RPM snapshots which will be released every week during commitfest via the new PostgreSQL Yum repository. Every once in a while - particularly if you are using inherited tables, you forget to put an important index on one of your tables which bogs down critical queries. Its sometimes convenient to inspect the index catalog to see what tables are missing indexes or what tables are missing a critical index. Normally we try to stick with querying the information_schema because queries against that schema work pretty much the same in PostgreSQL as they do in SQL Server and MySQL. For most of the examples below we had to delve into pg_catalog schema territory since there was no view we could find in information_schema that would give us enough detail about indexes. This will actually work equally well on SQL Server, MySQL and any other database that supports the Information_Schema standard. It won't check for unique indexes though. Solution - this one is not quite as portable. We had to delve into the pg_catalog since we couldn't find a table in information schema that would tell us anything about any indexes but primary keys and foreign keys. Even though in theory primary keys and unique indexes are the same, they are not from a meta data standpoint. Problem - List all tables with geometry fields that have no index on the geometry field. You have a very aggravated person who demands you purge their email from any table you have in your system. You have lots of tables that have email addresses. How do you find which tables have this person's email address. Below is a handy plpgsql function we wrote that does the following. 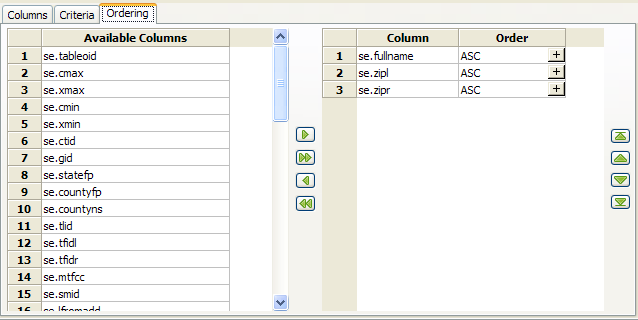 Given a search criteria, field name pattern, table_name pattern, schema name pattern, data type pattern, and max length of field to check, it will search all fields in the database fitting those patterns and return to you the names of these schema.table.field names that contain the search phrase. One of the nice things about the PostgreSQL command-line restore tool is the ease with which you can restore select objects from a backup. We tend to use schemas for logical groupings which are partitioned by context, time, geography etc. Often times when we are testing things, we just want to restore one schema or set of tables from our backup because restoring a 100 gigabyte database takes a lot of space, takes more time and is unnecessary for our needs. In order to be able to accomplish such a feat, you need to create tar or compressed (PG custom format) backups. We usually maintain PG custom backups of each of our databases. Below is a snippet of how you would restore a schema including all its objects to a dev database or some other database. psql -d devdbgoeshere -U usernamegoeshere -c "CREATE SCHEMA someschema"
pg_restore -d devdbgoeshere --format=c -U usernamegoeshere --schema="someschema" --verbose "/path/to/somecustomcompressed.backup"
Now restoring a single table or set of objects is doable, but surprisingly more annoying than restoring a whole schema of objects. It seems if you try to restore a table, it doesn't restore the related stuff, so what we do is first create a table of contents of stuff we want to restore and then use that to restore. Then simply open up the text file created from above and cut out all the stuff you don't want to restore. Then feed this into the below restore command. pg_restore -v --username=usernamegoeshere --dbname=devdbgoeshere --use-list="mytoc.list" "/path/to/somecustomcompressed.backup"
Sorry for the mix and match - note -U --username=, -d --dbname= etc. are interchangeable. For more details on how to use these various switches, check out our PostgreSQL Pg_dump Pg_Restore Cheatsheet. We've been playing around with the snapshot builds of PgAdmin III 1.9 and would like to summarize some of the new nice features added. PgAdmin III 1.9 has not been released yet, but has a couple of neat features brewing. Support for TSearch Free Text Search Engine. If you have a 8.3 database and are using 1.9, then you will see the new kid on the block in vibrant colors. 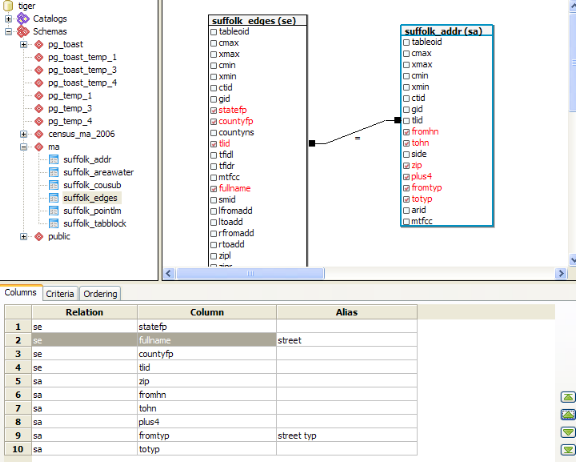 Graphical Query Designer - In 1.9, we see the first blush of a Query Graphical Designer. It all worked nicely except for 2 very annoying things. The way it makes joins - they are implemented as WHERE conditions instead of INNER JOIN, LEFT JOIN, RIGHT JOIN etc which makes its join type implementation <= and >= just incorrect. The other thing is that you can't write an SQL statement and then toggle to the graphical view as you can in hmm MS Access or SQL Server Enterprise Manager, although you can graphically design a query and toggle to the SQL View. 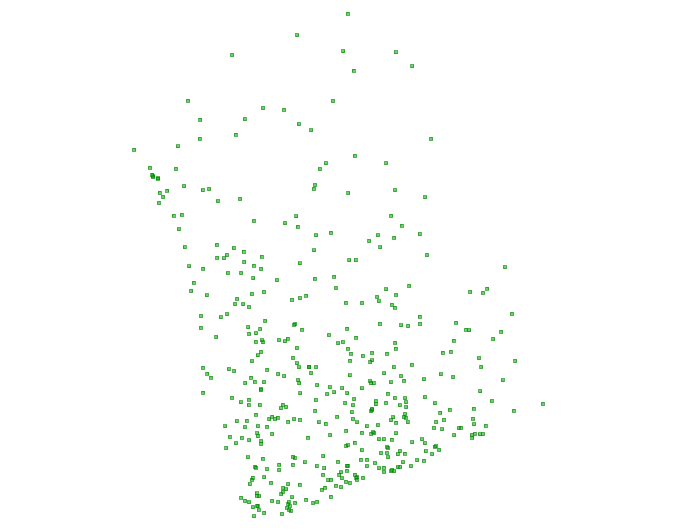 As Leo likes to say - "Query graphical designers are over-rated. They breed bad habits. I only care about having a graphical relational designer. Call me when PgAdmin III has that." And off Leo trotted, back to his Open Office Relational Designer. I still find it quite beautiful and useful in its current incarnation. It at the very least saves a couple of keystrokes. Below are some key niceties it currently provides. Ability to see all the schemas, tables at one glance and drag and drop them. Standard and the red-fonting of selected fields I find to be a nice touch. Easy ability to sort field display order and put in order of fields. Finally you can see full comments - In 1.8 and before - there was a tiny little window to see function, table comments. But now its a nice big scrollable/expandable window. 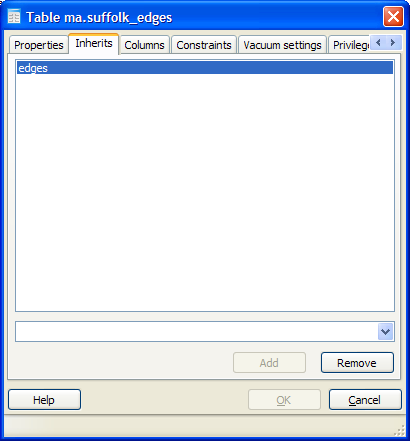 Ability to uninherit a table. 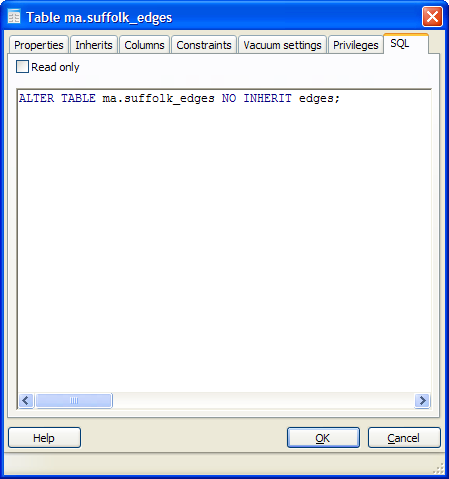 Just as in prior 1.8 after making a change to a table, you can toggle to the SQL tab before clicking OK to see what will be executed. This is an immeasurable learning tool. In addition to that, there is an additional Read Only toggle that allows you to uncheck and add additional SQL DDL of your own. One of the things we love most about PostgreSQL is the ease with which one can define new aggregate functions with even a language as succinct as SQL. Normally when we have needed a median function, we've just used the built-in median function in PL/R as we briefly demonstrated in Language Architecture in PostgreSQL. If all you demand is a simple median aggregate function ever then installing the whole R statistical environment so you can use PL/R is overkill and much less portable. In this article we will demonstrate how to create a Median function with nothing but the built-in PostgreSQL SQL language, array constructs, and functions. PostgreSQL has a very simple but elegant architecture for defining aggregates. Aggregates can be defined using any functions, built-in languages and PL languages you have installed. You can even mix and match languages if you want to take advantage of the unique speed optimization/library features of each language. Below are the basic steps to building an aggregate function in PostgreSQL. Define a start function that will take in the values of a result set - this can be in the PL/built-in language of your choosing or you can use one that already exists. Define an end function that will do something with the final output of the start function - this can be in the PL/built-in language of your choosing or you can use one that already exists. and also define a array_median function for dates. Keep in mind that PostgreSQL supports function overloading which means we can have all these functions named the same as long as they take different data type inputs. This allows the final user of our median function not to worry about whether they are taking a median for dates or numbers and just call the aggregate median(). In the steps that follow we shall flesh out the FINALFUNC function. Please note that array_append is a built-in function in PostgreSQL that takes an array and keeps on appending elements to the array. So conveniently - we don't need to define an SFUNC as we would normally. Now what makes creating a median aggregate function harder than say an Average is that it cares about order and needs to look at all items to determine what to return. This means that unlike average, sum, max, min etc - we need to look at all values passed to us, resort it based on the data type sorting rules of that data type and return the middle item. Here is where the beauty of array_append saves us. Now lets get started. We have conveniently everything we need gratis from PostgreSQL. Now all we need are our array_median functions that will take in our array of items collected during the group process, junk the nulls and resort whats left and then return the middle item. you can instead of using the array_append directly, create an intermediary that rejects nulls. That would probably perform better but require a bit more code. When there are ties, the customary thing is to average the ties, for our particular use case, we wanted the result to be in the list, so we are simply taking the last in the average set. You see the multiply by 2.0, that is needed because 1/2 is 0 in SQL because it needs to return the same data type as the inputs. To get around that we force the 2 to be a decimal. 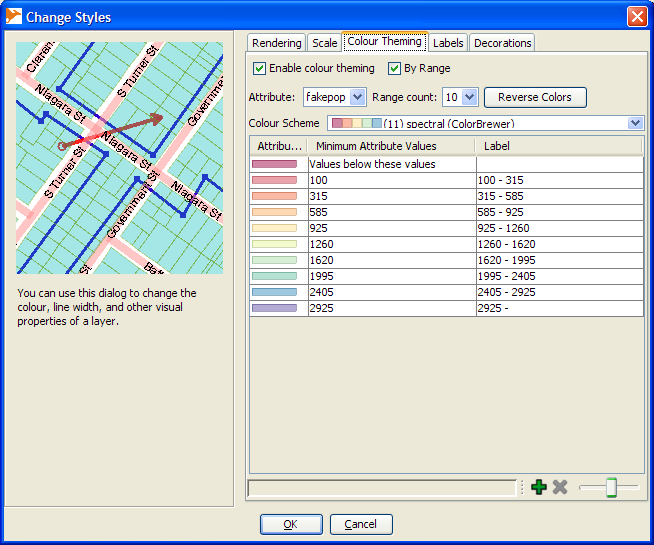 OpenJump is a Java Based, Cross-Platform open source GIS analysis and query tool. We've been using it a lot lately, and I would say out of all the open source tools (and even compared to many commercial tools) for geospatial analysis, it is one of the best out there. 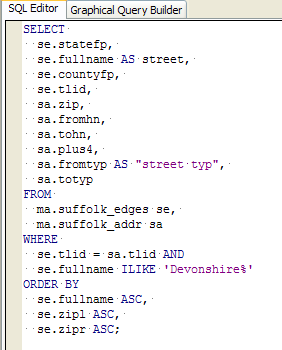 While it is fairly rich in functionality in terms of doing statistical analysis on ESRI shapefile as well as PostGIS and other formats and also has numerous geometry manipulation features and plugins in its tool belt, we like the ad-hoc query ability the most. The ease and simplicity of that one tool makes it stand out from the pack. People not comfortable with SQL may not appreciate that feature as much as we do though. 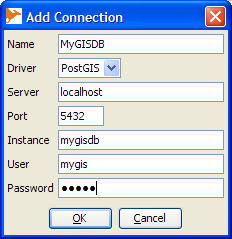 In this excerpt we will quickly go thru the history of project and the ties between the PostGIS group and OpenJump group, how to install, setup a connection to a PostGIS enabled PostgreSQL database and doing some ad-hoc queries. OpenJump is descended from Java Unified Mapping Platform - JUMP which was incubated by Vivid Solutions. OpenJump and the whole JUMP family tree have Java Topology Suite (JTS) as a core foundation of their functionality. 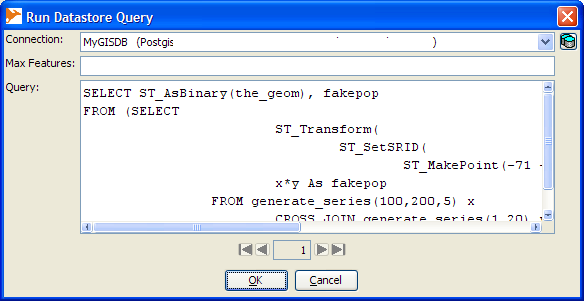 GEOS which is a core foundation of PostGIS functionality and numerous other projects, is a C++ port of JTS. 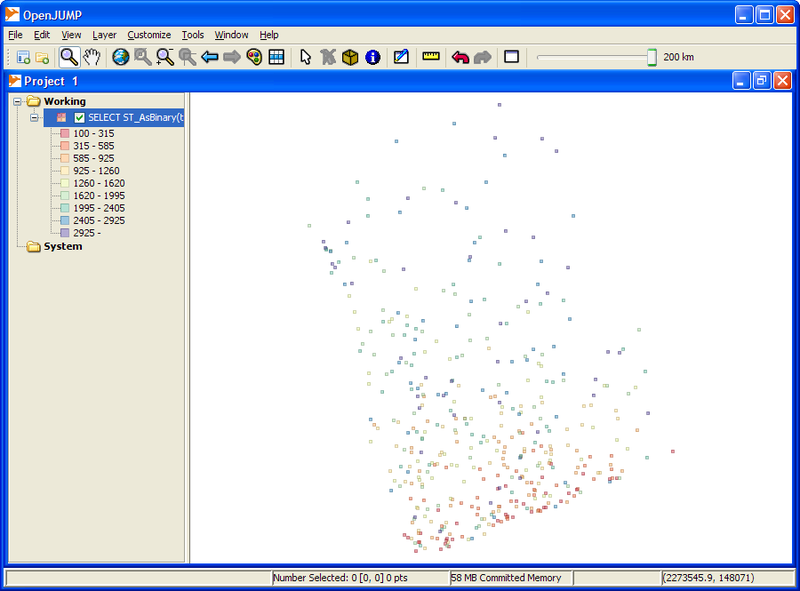 New Enhancements often are created in JTS and ported to GEOS and a large body of GEOS work has been incubated by Refractions Research, the PostGIS incubation company. For more gory details about how all these things are intertwined, check out Martin Davis' recount of the history of GEOS and JTS. Install JRE 1.5 or above if you don't have it already. You can then choose either the stable release version from http://sourceforge.net/project/showfiles.php?group_id=118054 or go with a nightly snapshot build. We tend to go with the nightly snapshot since there have been a lot of speed enhancements made that are not in the current production release. For snapshot releases, no install is necessary - you can simply extract the zip and launch the openjump.bat (for Windows) or openjump.sh for Linux/Unix based to launch the program. The production release includes an installer for windows. For those who don't know anything about PostGIS and have no clue how to load spatial data into PostgreSQL, please check out our Almost Idiot's Guide to PostGIS that demonstrates quickly installing and loading using Mass Town data as an example. Also check out our pgsql2shp and shp2pgsql cheat sheet for dumping and loading spatial data from PostgreSQL. Instance This is the name of the database you want to connect to. User, Password - The username and password of the PostgreSQL user you want to connect as. When you are done, your screen should look something like this. 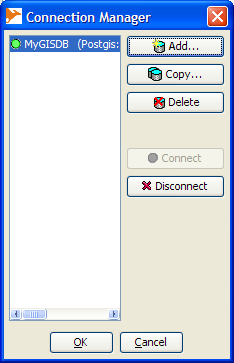 NOTE: There are options on the file menu that will allow you to save the view as PNG, JPG or SVG. Now if we want to change the colors of the points based on our fakepop, we do this. Switch to Color Theming tab and click to Enable Color Theming and also by Range.